THIS month, Japanese fashion designer Issey Miyake turns 81 and although he hasn't designed his men's and women's collections since the 1990s, devoting his time to research instead, he still oversees his staff's work and the various lines the company produces. The designer became known for his technology-driven work and the artistic vision that he brought to all of his early collections. Miyake was born in Hiroshima in 1938 and studied graphic design at the Tama Art University in Tokyo. After he graduated in 1964, he worked in Paris and New York City. By 1970, he had moved back to Japan and based himself in Tokyo, founding the Miyake Design Studio. During the Eighties, Miyake began to experiment with new methods of pleating that would allow greater ease of movement for the body. The garments were cut and sewn, then placed between layers of paper and put into a heat press, where they were pleated. The material's 'memory' maintains the pleats and the piece can then be worn. Issey Miyake developed a friendship with another great innovator in technology, Apple's Steve Jobs. The designer went on to make all of the the black turtlenecks which would become part of Jobs' signature look. But by 1994, Miyake turned over the design of the men's collections to Naoki Takizawa, so that he could return to research full-time. In 1999, he also gave Takizawa the reins of the women's wear collections too. Eight years later, Dai Fujiwara became the creative director and ran the Issey Miyake fashion house until 2012. The Spring/Summer 2012 women's collections were then designed by Yoshiyuki Miyamae and Yusuke Takahashi was made responsible for the men's line. 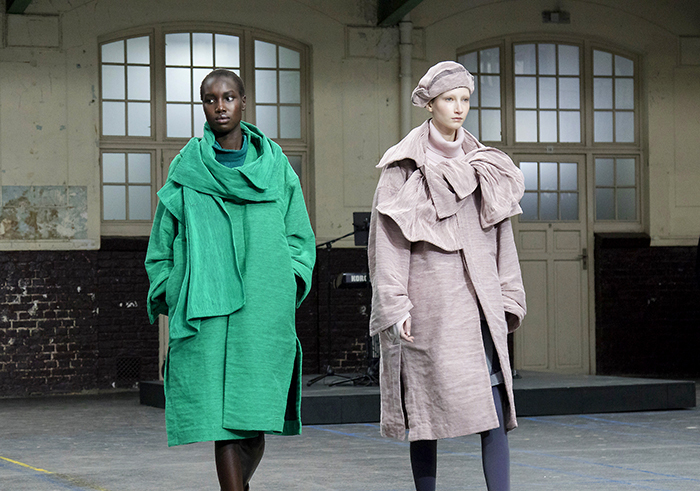 Experimentation is still at the heart of Issey Miyake under Miyamae, with last season's "Dough Dough" textile that can be moulded by twisting or crumpling into different shapes and now the current collection's new "Blink" fabric. This is made from a material created using resin printed on to it in bright, vivid colours. "Dough Dough", the textile used in last spring's collection, was also included in this season's and is a polythene-based material, allowing it to be sculpted into different forms. For Autumn/Winter 2019, it appeared to be more malleable and colourful, using a new mix of fibres, including wool. “A sudden inspiration invites you into a journey, where unknown sceneries take your breath away; unknown scents captivate you," said the designer about this collection. "You find yourself humming songs and getting to know unforgettable tastes, thinking thoughts you never had before. Chance encounters continue to stimulate our creativity." These ideas were expressed in the way the models walked in pairs and groups during the Paris show, like a choreography of people meeting and literally crossing paths, creating a geometry of movement. Held at the airy, shabby chic French Lycée Carnot, the AW19 show had live music by singer-songwriter Hiroko Sebu playing her Korg with another musician on a drum synthesizer. Models criss-crossed the open space covered with dark-green girders and a glass roof. It was a lively and vivid collection with bright dashes of colour mixed with more subtle confections and different textures like knobbly pale grey knits for coats and dresses. A pale pink coat had a fluid, wave-like collar and there were dresses with kaleidoscopic motifs in brilliant colours with flowing silhouettes. 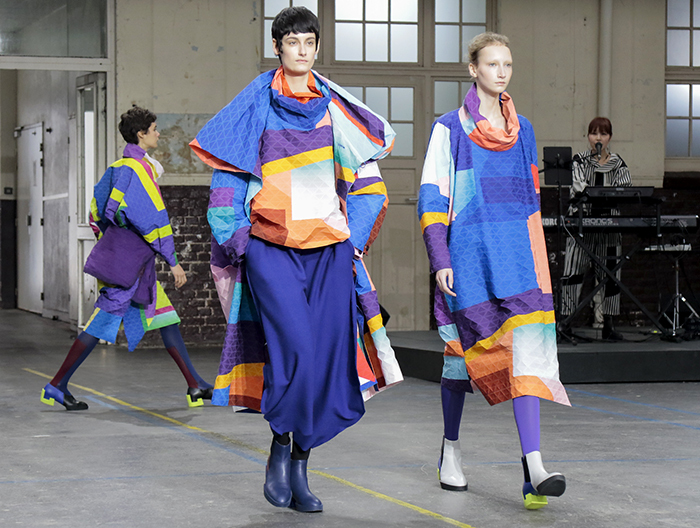 The motif of this Issey Miyake collection is the combination of fluent forms and a palette of neutrals mixed with unusual combinations of colour. For example, the floating purple, yellow, green, blue and black skirt paired with a navy blue jacket and lime turtleneck worn with a long, blue skirt. 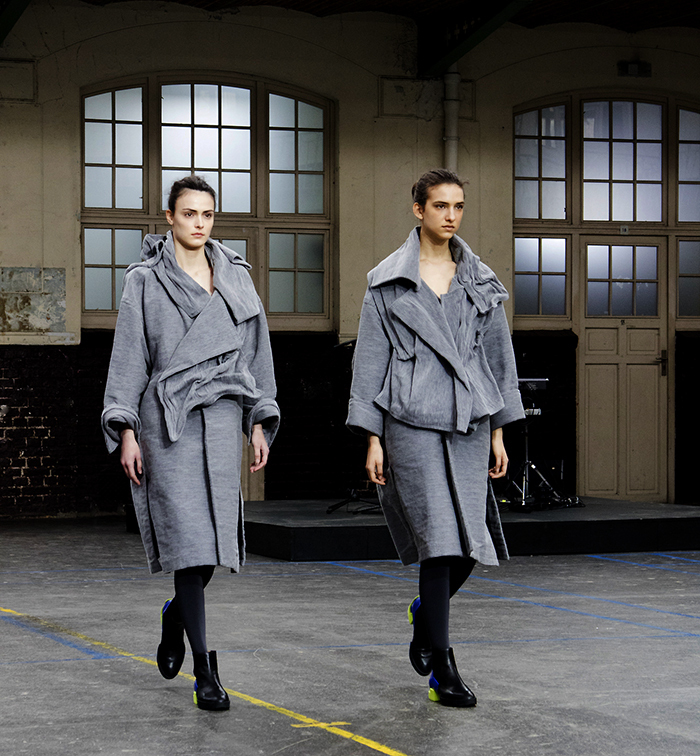 The first looks in the collection included coats and skirts in the “Dough Dough" material that can be moulded to create a variety of shapes. 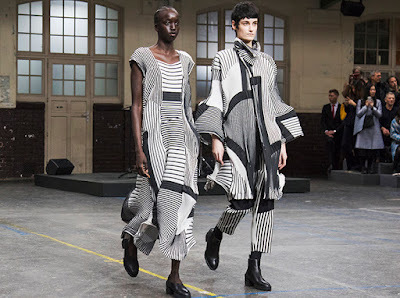 There were also looks that included the Issey Miyake pleats ~ more like loose folds ~ in black and white with patterns like a sheet of music. The new fabric with it's triangular grids of pattern was used for voluminous coats and long dresses in panels of multicolour technical pleating. 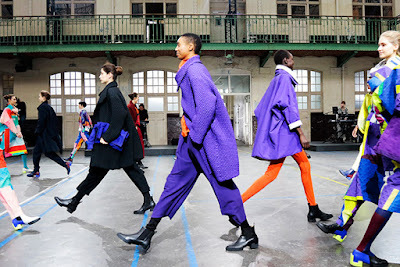 The polychromatic looks were a play on geometry and colour and these were highlighted by the clever way the Paris show began with pastel hues and plain fabrics and then built to a finale where there were strong patterns and vibrant hues in purple and lime green. There were even brilliantly hued checks in wool used for tunics and overcoats. The geometric diamond design was inspired by Issey Miyake's signature Bao Bao bags. This pattern was used for coats as well as tops and trousers in both black and white and vivid colour. 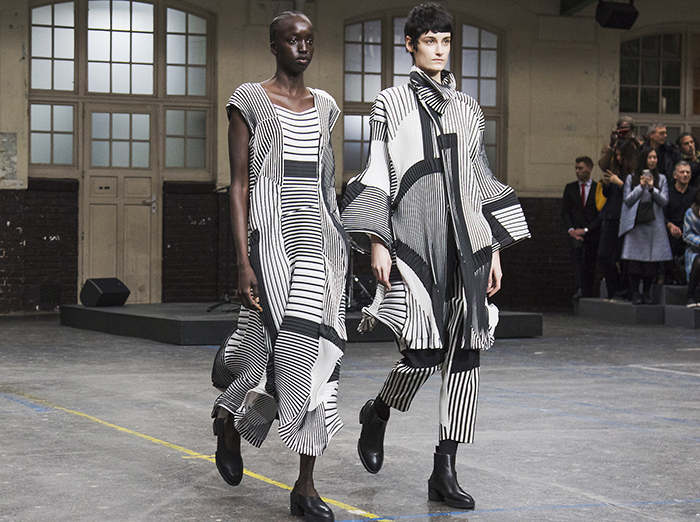 The new collection by Miyamae managed to combine both technological innovation with designs that were comfortable yet with the avant-garde Issey Miyake aesthetic that gives a dash of poetry to wearing clothes. This week, Design & Art Magazine welcomes our readers from Japan, Italy and the United States. Editor-in-chief Jeanne-Marie Cilento is an award-winning writer, presenter & designer based in Rome, Italy and Sydney, Australia. Elli is our special correspondent from Paris, she is an award-winning fashion photographer, video director, photo media artist and university lecturer. Mariangela studied at Paris' Sorbonne University and has worked with top fashion houses producing film, television and documentaries. Ilaria is our Milan correspondent who is passionate about new art, design and photography. Paul is the Creative Director at DAM Publications. He is also an award-winning director in television and cinema. Contributing Editor & Photo-journalist Christian comes from the Philippines but is now based in Rome as both photographer and artist. Contributing editor Ruth is a writer and film director based in Udine in Northern Italy and Melbourne, Australia. Journalist Alessandra is a critic and writer on Italian art and culture and heads the Palestrina Film Festival. Copyright © 2013-2018 Design & Art Magazine. All rights reserved.